The Swedish band Narnia is introducing on their new album a new singer - German Pascal from Brazil who replaces founding member Christian Lilijegren. Whenever a band has a new singer there is one question: 'Will the new one be able to replace the former singer and will it effect the sound of the band?' Musically they stay on the chosen path and offer melodic metal with crunchy riffs, melodic keyboard parts who carry the song in combination with catchy refrains and pathos - that's Narnia's framework. The shredding is still there and so the quite commercial songs get heavier. Singer German is obviously influenced by Ronnie James Dio and is able to vary - even when singing high notes. 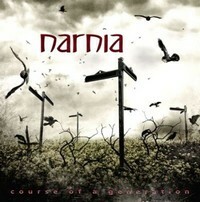 The heavier sound fits well to Narnia. Melodic metal fans should grab a copy!! !